So what is a desert? Close to a third of the world's surface is considered desert. Most people think of the vast sand dunes of the Sahara as seen in Hollywood movies. But a desert is defined as any arid land area that generally receives less than 10 inches (250 millimeters) of rainfall per year. Most of the little water it does receive is quickly lost through evaporation. Average annual precipitation in the world's deserts ranges from about 0.4 to 1 inch (10 to 25 millimeters) in the driest areas to 10 inches (250 millimeters) in semiarid regions. Antarctica and parts of the Arctic are considered desert, but we are going to cover what we could call a hot desert. Unlike desert plants and animals, humans have not developed the extreme protective mechanisms needed to truly "survive" in the desert. So what that should tell us is that we must thoroughly prepare to travel or survive for a set period of time within this arid territory. Part of this preparation must include obtaining and using the proper protective gear and supplies. 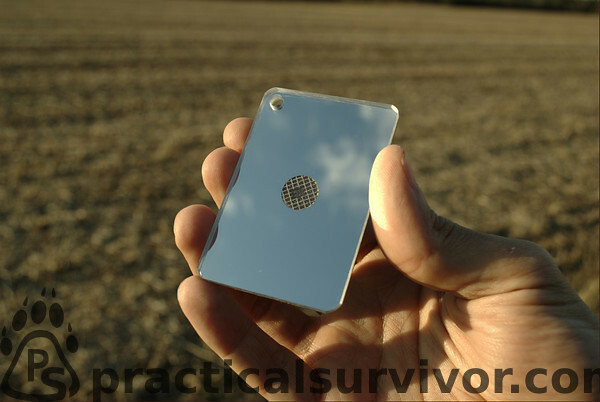 A signaling mirror such as Ultimate Survival Technologies' StarFlash mirror can be seen at surprisingly long distances. Learn how to properly use one. Do not wait until you need it. If a signaling mirror is not available, we could break a side mirror off your vehicle, find anything shinny such as a CD. It is good practice to learn multiple signaling methods. A distress signal can be 3 fires in a V shape or piles of rocks in a triangular shape. Note: If you have elderly or infants in the group, they could be affected by the temperature changes more quickly. Do whatever is necessary to get them in the shade as soon as possible. Pouring water on clothing can help to cool them down. What are some of the dangers of the desert? We already discussed dehydration, but what are other dangers encountered in the desert? This is one that surprises some people. Due to the misconseption that deserts are hot, people do not prepare for the cold temperatures. If you take a look at deserts of the world by area you will find that there are plenty of cold desert climate regions. However in some deserts you may have to deal with both extremes. During our last visit to Arizona daytime temperatures were in the 94 Fahrenheit during the day and dropped to 38 Fahrenheit at night. Once the sun goes down, desert temperatures drop rapidly at night. Whether in your vehicle or backpacking make sure to include proper clothing and items which would keep you warm. An old wool military blanket or Mylar sheet can be a life saver. Several methods of firestarting is essential in any pack. Hyperthermia, Heat Stroke the temperature of the body is elevated from the heat of the sun and activity. Add dehydration to the mix and the body can begin to feel symptoms such as nausea, vomiting(causes futher dehydration), dizzyness, headaches. The heat stress causes thermoregulation allowing the body to overheat. As the body loses the ability to control its temperature a heat stroke can occur. If hiking in the desert, it is a good idea to have planned water and rest breaks throughout the day. Find or make shade if at all possible. Poisonous Creatures such as snakes, centipedes, scorpions, spiders, and Africanized bees are a few. If there is a need to work on a vehicle, we must keep in mind that there are poisonous creatures that are always trying to find shade. Wearing gloves is helpful. If you leave the vehicle to find shade, pay attention to where you sit and what you touch or brush up against. If you take your shirt off and hang it somewhere make sure to check it. If you take your shoes off do the same. Scorpions and other desert creatures are nocturnal, they move and feed at night. As the daylight begins they will find rocks, crevices or your clothes to hide under. You also have to deal with skunks, javalina, coyote bobcats and mountain lions. An injury in the desert can make the difference between life and death. Stop! Slow down, think and take your time before you act. Pay attention to the plants around you A lot of plants in the desert are covered in spines. The hedgehog cactus and prickly pear cactus can easily puncture the skin. Contrary to Hollywood imagery most cacti will not provide potable moisture and some are toxic! There are some that would argue that an emergency/survival kit is pointless. That proper planning of a trip is all that is needed. I wonder, if the survivors of well known Uruguayan Air Force Flight 571 would feel the same way. Perhaps we could ask Steven Callahan how much his emergency dry bag helped him survive 76 days adrift at sea? Perhaps we have become so used to the idea that someone will always come to rescue us, that we have stopped thinking for ourselves. True, surviving a plane crash would be a miracle in itself, but how disappointed would you be if you survived the crash only to die of hypothermia. There are countless stories of survivors that were able to use a few crucial items to get them home alive. By all means, plan the trip and let your loved ones know where you will be. But people have died in hours killed by dehydration and hypothermia. Better to have the gear and not need it. Part of an emergency / survival kit was covered while discussing vehicle preparation. But items could be helpful to carry in a small backpack. 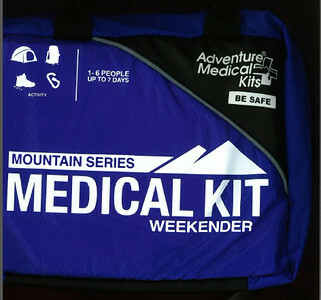 Lets cover a kit we recently used during desert hiking. Did we mention water? Multiple ways to store and carry water are essential. We used two water bladders and a Nalgene water bottle. We prefer the Stainless Nalgene bottle so we can use it for boiling as well as transporting water. Another great piece of equipment is a puncture resistant water bladder such as the MSR Dromedary or DromLite bags. Understanding the lay of the land and different methods of finding water can be helpful. We will cover water procurement tips on our futurel articles. We cannot forget at least one item for water purification. Whether it is boiling, a ceramic filter, chemical tabs (Chlorine Dioxide or Iodine), taking every step towards making sure the water is clean is essential. Drinking unclean water can lead to further dehydration or worse. There are inexpensive and lightweight products such as Potable Aqua's Chlorine Dioxide or Iodine tablets. Make sure your cellular phone is charged and bring a charger if possible. Road flares, Chem Lights/Lightsticks/Glo-sticks, Signal mirror, Whistle. If the situation calls for it, prepare a signal fire. Use the spare tire to create smoke. 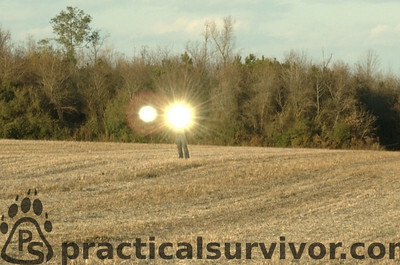 Flashlights are also a great piece of equipment to have. It can help us move in the dark while avoiding injury and also can be used to signal. A good quality Compass, GPS and a Topographic map of the area. Protection starts with proper dress attire. Covering the body from the sun and the hot/dry air. Learn about proper clothing materials. Wear a hat and sun glasses! Protection also includes items that would help to build a makeshift shelter in an emergency. A reflective blanket or tarp, can be set up quickly and help protect from the sun's rays. It can also be used to reflect the heat from a fire at night. Shelters such as the LEAN-TO can be built using a reflective Mylar blanket. In the picture below we use Adventure Medical Kits SOL Emergency Blanket to build an expedient shade shelter. Modified emergency blanket shelter built using a Saguaro cactus rib. Build up on the foundation adding items will ensure most emergencies are covered. Remember items in first aid kit can be used for other emergencies. Alcohol wipes, magnifying glass and bandages can all be used for fire starting. Duct tape can be used to repair your boots or cover a blister temporarily. Lighters, magnesium blocks and Ferrocerium rods should be part of the kit along with tinder. Fire is a great way to signal. Fire helps with signaling, water purification, mental state and fight off hypothermia. Traveling and backpacking in the desert can be a wonderful experience. With careful planning and preparation, we have been able to visit beautiful regions and experience desert wildlife. Plan the trip ahead of time. LEAVE A TRAVEL PLAN! Let loved ones know of your plans and numbers to call if you do not check in on time. Carry an emergency kit built around the particular needs for the territory traveled. Lastly, take the time to read books and documentation written by people that live in the area. Get training from qualified instructors if at all possible. 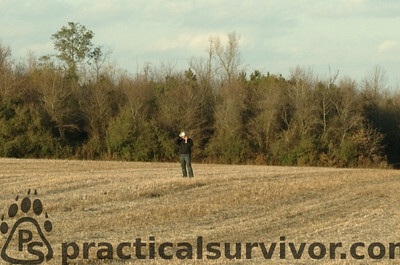 Most survival situations can be avoided. Sometimes unavoidable situations arise and this is where an emergency kit can make all the difference in the world. If you left a travel plan with with your safety contacts, help should be on its the way. Conserve energy and water and wait.